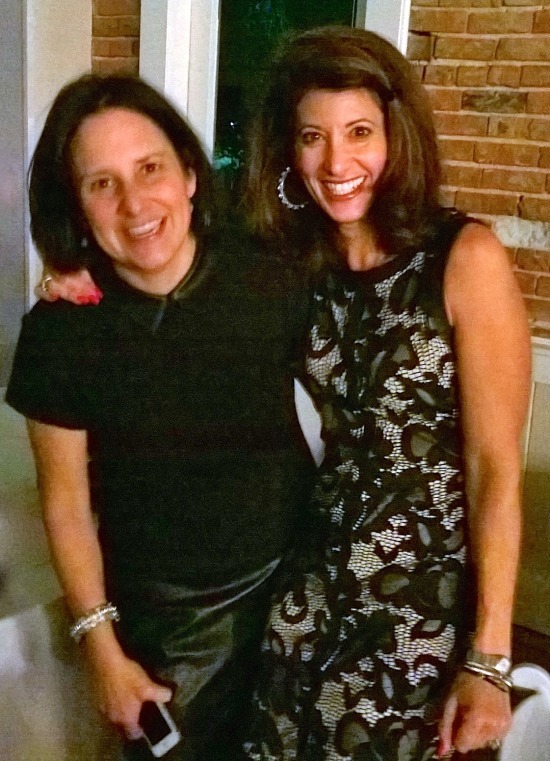 After building her impressive resume at Microsoft over the last 22 years, Lori DiJulio-Horey recently decided it was time to write a new chapter in her life and stepped off the corporate ladder to reflect and determine her next path. Major life changes like this are never easy, but it often takes a leap of faith such as this, so that we can be led to bigger and better things. We are so inspired by this mom and how she’s pursuing her new yet-to-be-discovered dream in style with her family — including her husband Matt of 20 years, 11-year-old son J.D. (Joseph Donald) and two darling dogs — leading the cheer section. Lori, Matt and J.D. in Italy this summer. 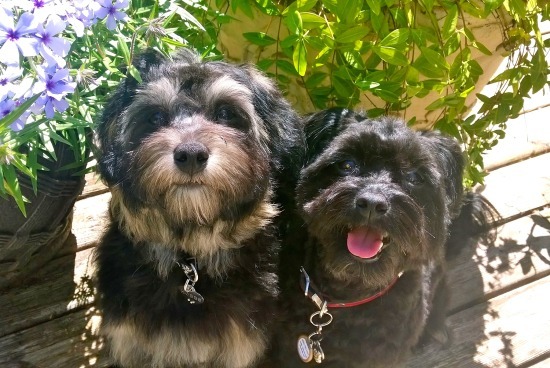 Lori’s super-cute Schnoodles, Harlee and Hobbs. A graduate of the University of Washington, Lori was born in Seattle and now resides in Woodinville, Washington. 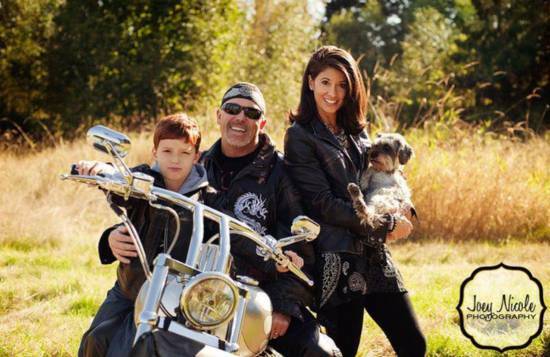 She embraces the quintessential active Northwest lifestyle, and her favorite pastimes include jet skiing, waterskiing, competitive running, and riding on the back of her husband’s Harley. With a love of all things fashion, Lori lists shopping as her favorite indoor hobby – we can so relate! Health and nutrition are of great interest to this mom due to health issues she has witnessed in family members over the years, beginning with her seemingly healthy father dying of a major heart attack when she was only 11. In addition, her mother passed away of ovarian cancer at 79 and her siblings have dealt with cancer as well. Dreaming of becoming a mom, Lori herself endured several years of infertility treatments, only to finally become pregnant naturally with J.D. Doing all she can to optimize her own health from the inside-out, Lori is a big fan of alternative, naturopathic and Eastern medicine, and can be found reading about the latest nutrition discoveries daily. Philanthropy is a major part of Lori’s life, from volunteering at her church and her son’s school to Food LifeLine, to name a few. She is also a big believer in building communities where “neighbors” help each other out in times of crisis. For instance, in addition to managing their high-tech careers, Lori and her husband (he still works at Microsoft) own a waterfront motel and commercial property on the Columbia River in the small town of Pateros in Eastern Washington. They fell in love with the town and became a key part of this close-knit community through events and donations. This past July, Pateros was devastated by Washington State’s largest wildfire in recorded history. The fire destroyed over 300 homes, so the Horeys opened up their motel (which luckily escaped the fire) for several weeks to anyone who’d lost a home or needed a place to stay. The couple also set up a catastrophe fund where 100% of the money went directly to those in need — prioritized by families who lost everything, children and the elderly. Lori herself publicized and promoted the fund, while her husband made it his mission to hand-deliver the funds to each family. This effort is still in progress as needs continue to change while the town recovers. To help those rebuilding, the Horeys’ motel recently installed frost-free hydrants at its RV sites during “Make a Difference Day” to provide a place for fire victims who have an RV and would like to stay in town for the winter. 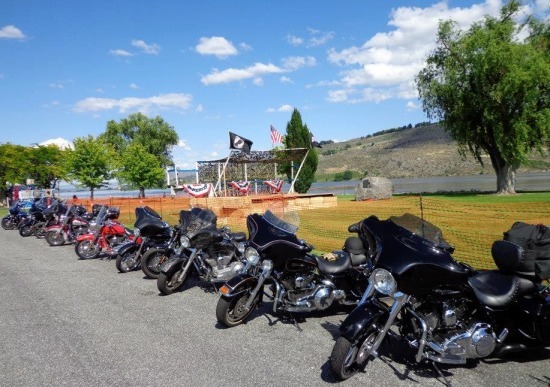 In addition, Lori is involved in her husband’s motorcycle club, and the couple started an annual, family-friendly charity biker run in Pateros. Each year, donations from the run go to one of several war veterans’ funds (e.g., Wounded Warrior Project, NW Honor Flight). An amazing cause that helps the people that defended our country. Ready for the charity biker run in Pateros, Washington. This is one busy, stylish mom with a big heart that is committed to making her community a better place! Classy, edgy, confident, blingy, fun. The one thing I am certain about – I don’t like plain things. I love details and accessories! 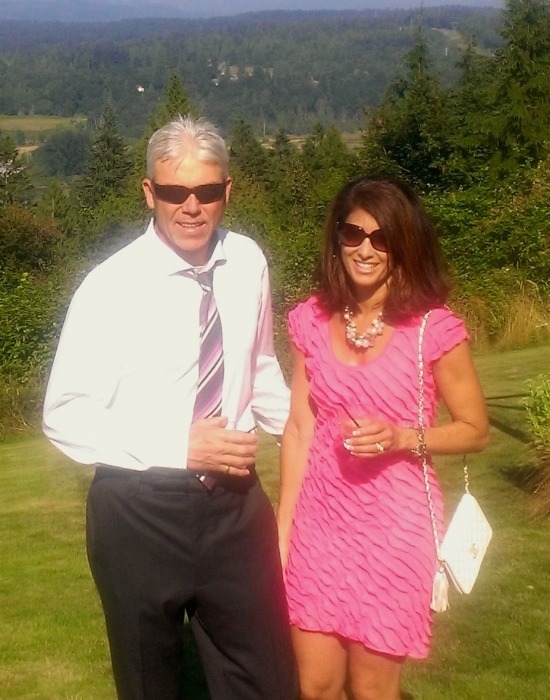 Lori rockin’ a beautiful lace dress at a wedding this past weekend. MSL: Until recently you were in the corporate world, what’s next? Good question. I’m giving myself time to really think about what I want to be doing next. I’m thrilled to experience the holidays without the stress of a corporate job lurking over me, but even more excited knowing I’m driving what’s next. Plus, while I work through this decision I get to spend more time with my family and be a more involved mom! I would love to work in a capacity where my passion around meaningful relationship building is at the forefront. I love to drive impact through outcomes that involve detailed planning and execution. I want to be able to align my personal values within a role where my strengths (relationships, social intelligence, detail orientation, dependable) and knowledge (health/wellness, fashion) – can all make a personal impact. This is a key factor at this stage in my career. I’m such a fashionista at heart — I have FOUR items I can’t live without. My bracelets! I love a good stack of color-themed bracelets with differing textures and materials – that’s a must! Jeans…too many pairs to count! I love boot-cut jeans with a heel – visually, they give you a long, lean look. Jackets with embellishments – zippers, different trim, unique buttons, distressed leather, etc. Lastly, a pair of unique boots is a must! 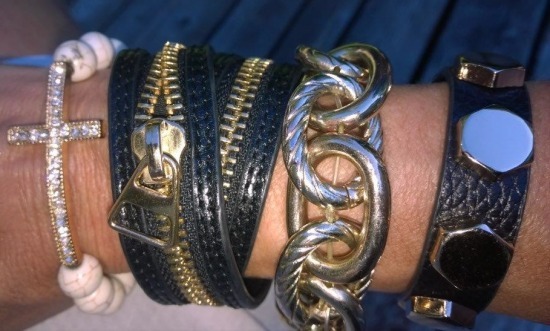 One of Lori’s favorite bracelet stacks. My mother was someone I always admired. She aged beautifully and always strived to look her best no matter what she was doing or where she was going. She was extremely stylish and knew exactly how to dress for her body type even into her late 70s. 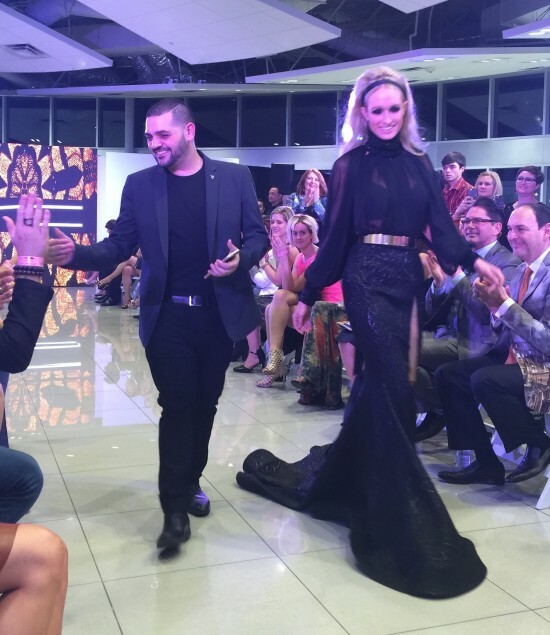 MSL: Fashion often comes with a price tag stigma. Do you have any advice for moms who have Jimmy Choo dreams, but a Target budget? You can always find inexpensive items that look spendy. They are out there and there’s no need to spend a fortune on your wardrobe or accessories! Target, T.J. Maxx, Nordstrom Rack, Ross, Marshalls, Charming Charlie, Macy’s, just to name a few. If you look hard enough you can sort through the cheaply made vs. quality items which all of these stores carry. Be picky. I also believe in having a few really nice, high-end pieces that you know you will have forever and outlast trends – designer bag, timeless coat, designer watch, etc. Lori stylishly accessorized at an event with her husband. MSL: We love your commitment to healthy living. What’s your biggest beauty secret? Organic coconut oil! I use it all the time and for just about everything. Taking off my makeup/mascara, moisturizing my entire body/face, sautéing veggies, and frying eggs. My dogs even love it and it’s great for their coats! The one thing I have yet to try is ‘swishing/oil pulling’ – it is supposed to be fabulous for the health of your teeth and gums. Overall, coconut oil has SO many fantastic healthy and healing properties! 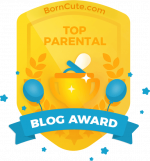 I purchase mine at Costco – it’s the one ginormous-sized item that doesn’t go to waste in our house! I have a brother 22 years older and a sister 19 years older than me, all by the same parents). 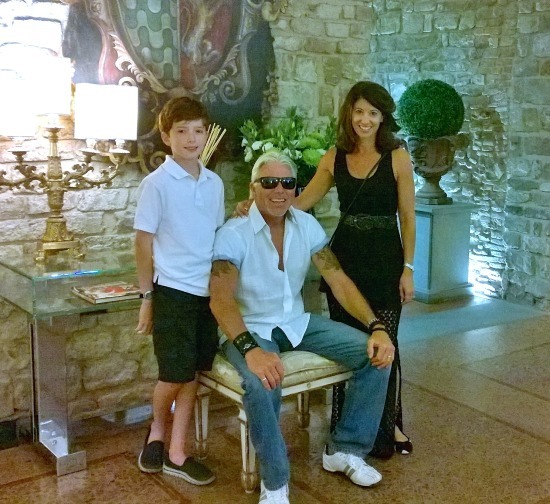 My mother had me at 44 – clearly a surprise with a son and daughter in college! My oldest niece and I are just eight years apart – she’s like a sister to me. On my dad’s side of the family, I am the youngest first cousin and the oldest is in his late 80s, so there is almost a 40-year age gap in first cousins on the DiJulio side. Know your body type and what accentuates it the best! At any point, there is always something fashionable that will work with your body type – you just need to be aware. I cringe when I see short or tiny people wearing overpowering items (huge bags, coats, long shirts), or larger people dressed in clothing pieces that show every bump and bulge. And don’t forget, there’s no need to look frumpy when you work out. Why not look cute and put together? Zella is currently my favorite workout wear. Plus, you feel better if you are in something that you like!